Fine art, Illustration, graphic design and the art philanthropy of Sam Morrison: When is $1000.00 not a $1000.00??? This is going to be an odd post. First off, this is completely real. I’ll be giving away a $1000.00 gift certificate to selectyourgifts.com to the first person who emails me. If you’ve read a few of my other blogs you can gather I like making up stuff to write about. (Everyone knows I don’t mind women school bus drivers). Anyway, this is different. Real life is always better than fiction. Here goes. On Tuesday (3/29) I received a yellow envelope addressed to Account Holder with my address on it. Despite that it looked like junk mail I opened it anyway. Enclosed was a brochure advertising a 5 day used car tent event for a specific Auto Group. (I don't know anything about being sued for libel/slander so I'm going to keep the dealership anonymous. 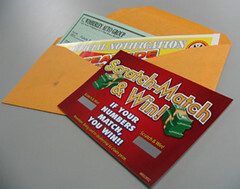 )In addition to the brochure there was a scratch off lottery ticket kind of thing and a fake check with a pay to the order of: Future Satisfied Customer for $1000.00. Oddly enough, I had a really strong feeling I was going to match the numbers. Reason being, there were no rules and regulations printed on the card. Usually these kinds of promotions have their odds of winning printed somewhere on them. This card had nothing. That lead me to believe all the cards were going to be winners. I’m never one to get sucked into these kind of promotions. But, I’m trying to be more spontaneous. The car lot was only 10 or so miles away. I could be done with the ordeal in less than a half hour. So I went. I arrived at this tiny strip of land on US 131 that used to house some kind of flea market business. At least that’s what it looked like to me. The only parking spots available were taken by the used cars. I finally parked, got out and looked for a sleezman. I mean salesman. I decided to be somewhat cocky. I may be a sucker for scratching lottery ticket looking things but, generally I’m not a sucker. Especially for things involving used cars. I flippantly asked to see the “big board” to view what I won. I deliberately memorized the winning number because I didn’t want to show a salesman my scratch card, have him review it then say I’m sorry you didn’t win. When maybe I did. I wanted to see the board for myself. Long story short, I got bounced to three separate salesman all of whom knew nothing about a “big board.” Finally one salesman knew the “big board” was in the tent. Escorted into the huge white tent, I checked the board for my number and what I had won. It was a vacation or a $1000.00 online shopping spree. I wasn‘t real big on having a used car dealership book my vacation so I chose the $1000.00 shopping spree. To finalize my winning, the salesman only jotted my name and address down. That was it. Just give my name and address. No congratulations! How exciting for you! Nothing. Next he motions me to follow him to this nasty old pole barn to claim my prize. Housed within this nasty old pole barn are a couple used car salesman types with their laptops on a folding table. Nonchalantly, the sales guy I’ve been dealing with walks over to this monster stack of gift certificates and hands me one. Again no applause, no congratulations, no nothing. According to the prize instructions on the brochure the only gift certificates you can win are for $1000.00. Judging from that stack of certificates there had to have been a couple million dollars worth. I kept thinking, shouldn’t those be in a safe. Then I remembered, the rules state they’ll be giving away gift certificates to the first 50 winners each day. OK, do the math. That’s $50,000 given away per day, over the course of 5 days. That’s $250,000.00. That doesn’t even factor in the other prizes given away. I saw the cars. If the entire car lot sold out I find it hard to believe they’d clear $250,000.00. Either they’re really bad business men or I just stepped in something. The odor was really bad. I definitely stepped in something. So after the handoff of my $1000.00 gift certificate the salesman and I had an enlightening conversation about Christianity and sand bags. (See reality is much more interesting than fiction. Christianity? Sandbags?) At that time I warmed up to him a bit. Nice guy. Not like a used car salesman. During the course of the conversation he mentioned his pastor was one of the general managers standing near the tent. In all fairness I don’t know if he (the pastor) had anything to do with planning this event. But...???? Anyway, I took the gift certificate home. Got online, went to www.selectyourgifts.com and typed in the certificate and password numbers . I admit to being somewhat excited. Everyone loves a mystery. Who knows what cool items they’d have. Ipods, TVs, Laptops, Video Cameras, Still Cameras, Software. After all, the brochure showed images of pool tables, grandfather clocks, suede jackets. Excitement soon turned to utter boredom as I went through their different gift classifications. This certainly wasn’t Amazon.com. No Ipods, No computer systems, No Tvs, No MP3 players. Nothing like that. It was more like outdated computer software, cheapo web cameras, lame magazine subscriptions. What's more, each of these gifts requires you to pay the shipping and handling, plus a one time $5 processing fee. That $1000.00 just doesn’t seem like a $1000.00 anymore does it? I vaguely remember an ugly suede jacket costing around $28 s/h. For me personally, the only thing that caught my eye was a MacAddict magazine subscription. I certainly don’t need a thousand subscriptions to that. So in my hands this $1000.00 gift certificate is completely worthless. That’s not to say one of you reading this may not find $1000.00 worth of useful things (and $2000.00 worth of shipping and handling fees).. So if you’re curious, the first person to email me gets the passwords. Worse case scenario you can always give it away as a gift. Or best case scenario, give it to your boss and get a promotion. (Most bosses can be bought for $1000.00. So I’ve found). Unfortunately you can’t browse the merchandise without the codes. I thought about posting the codes so you folks could browse. However, whoever would get the codes and started buying stuff by credit card could potentially have people logging on and making purchases in their name. Obviously I decided against that idea. So who’s gonna be the lucky winner? Email me.... First person gets the codes!!! I’ll post if anyone won tomorrow. I promise whoever wins, your identity will remain anonymous. Ironically, a coworker of mine also got the same promo envelope. He scratched and matched the same numbers I did. He too was a $1000.00 shopping spree winner! Unfortunately, the event was over. But, I made sure to congratulate him in a big loud voice. It’s more than I ever got. i got scamed also by an automotive dealership. why thought we were in the united states .